First things first: getting bogged down with whether you’re blobby or not isn’t going to motivate you much to exercise, it’s just going to make you feel, well, blobby. But you can also see the underlying prejudice: skinny = strong, fat = weak (physically as well as in willpower). Pilates fitness is for anyone who wants longer stronger flexible muscles. 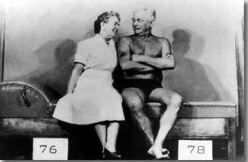 Joseph Pilates originally created his workout equipment and exercise program for rehabilitation and injury prevention for dancers. Since then, it has become an exercise routine for anyone who wants to strengthen the core, increase flexibility or create a supple beautifully working body. The Pilates method teaches awareness of the body, breathing and movement. Properly taught, Pilates does not exclude overweight people or the morbidly obese. There are benefits for every body, young or old, male or female, skinny or overweight. Pilates’ goal of long supple muscles, postural alignment, and abdominal (core) strength doesn’t necessarily include weight loss. Weight loss has become the focus of many types of exercise and mind-body fitness movements, including yoga, and we know a lot of people out there that want to be skinny – our society glorifies skinny. We don’t. We want you to recognize that skinny does not equal healthy. Is your brain exploding now? Is everything you thought you knew about health being challenged? Let go of your preconceived notions about health: a size 2 doesn’t necessarily mean healthy. We’ve seen plenty of larger-sized students bust out perfect push-ups by the dozens, and rail-thin students who can barely lift their shoulders to a crunch. In fact, adding weight or a dress size might even make a size 2 girl healthier, since muscle weighs more than fat – it just depends on how much muscle is on that size 2 girl to begin with. We’ve all heard of ‘skinny-fat’ – well that’s what I’m talking about. At Studio Be Fairfax, our goal is to help you build your own best body and to have fun doing it. The beautiful body isn’t a prerequisite to a Pilates class – or to life. All students must start somewhere with the body they are given or have created. Sometimes that means weight loss. Sometimes it means weight gain. The awesome thing is that your body finds its own happy place when you give it the right tools to do so. In fact, learning to love your body and all of its perfectly ok imperfections will probably add years onto your life from all the stress you skipped out on. Pilates at Studio Be, along with a healthy (most of the time) diet, can be part of your arsenal. The Pilates workout is a gentle workout; paradoxically, it is challenging and rigorous. Whether the goal is to add muscle and strength, avoid joint pain, learn to balance and prevent falls, or strengthen the stomach muscles while dieting or adding on weight, it will give you results. Big bodies won’t look the same on the equipment as smaller bodies. That is, the stomach doesn’t disappear in the scoop pose, nor do the thighs necessarily lift off the ground. That doesn’t mean the effort is wasted. Proper Pilates breathing is part of the fitness routine and is a learned activity that after regular practice becomes normal and automatic. Equipment practice needs an experienced Pilates instructor before entering group classes. Being heavy, skinny, male, or middle-aged isn’t a reason to avoid Pilates. The Hip Hop Ab workouts are a fantastic example on how to build not only strength in your abs but at the exact same time burn calories and fat. Hip Hop Abs uses standing abdominal moves to work the muscles. This involves the tilt, tuck, tighten technique that might be done anytime. Not merely will you burn calories and sculpt six pack abs but you can also learn a couple of cool dance moves from the workouts also. After research a number of of the blog posts on your web site now, and I truly like your way of blogging. I bookmarked it to my bookmark web site list and shall be checking again soon. Pls take a look at my website online as well and let me know what you think. I simply want to tell you that I am just beginner to blogging and honestly loved you’re web-site. Very likely I’m going to bookmark your site . You certainly come with superb well written articles. Thanks a lot for sharing with us your blog site. im so lucky that i came across your site. Thank you. « You’re such a Tease….